The Saint Stephanus gate closes down the Singing Sea street from the Europe Place side. This artistic structure has been built in the best organic-architectonic traditions in memory of Hungarian first Christian king. It successfully unites the harmony of the East and West, and all the folk and modern architectural achievements. Hungarian first king was born in Esztergom, in 975. 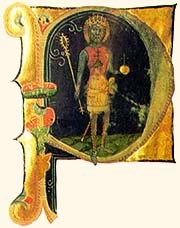 The great prince - Géza's only son was given a name Vajk (in Turkish - hero, leader). Later he was renamed to - Stephanus after the Christianity's first martyr called Saint Stephanus. As the legend goes, he studied Latin in his childhood and his father prepared him for ruling. He married the Bajor prince's daughter - Gizella, and she brought many German priests and knights to the country. This act was of great significance for reasons of abandoning the old religion, accepting Christianity and creation of the unified church.